Freedom Be//Feels dark urges to put a 3S-GTEs into Previas whenever he sees them. Take your time and enjoy your new friend. Where are you located? Someone may be close that is willing to lend a hand. I am south bay area, anybody with some knowledge on these cars would be greatly appreciated. Look at some of the MR2 sites also. some of those guys don't come to club4ag. Might be someone there in your area. Some parts that you may need can be found on pretty much all these sites, like the block, head and internals, just in case yours are toast. Overall there is a great wealth of knowledge to be had here and there. If you know it's a rod problem the best thing is not to run the engine any more and just start your tear down. The engine usually comes out the bottom of the car but can come out and go in through the top after removing all the ancillary components, intake, exhaust, starter, A/C, alternator etc.. Makes for a difficult reassembly. I did it on my first MR2, it was a pain, but I didn't know what I was doing then. So, where to start? What experience do you have and what tools are at your disposal? And the big Q, what is your budget? Look at $1.2-3k depending on your desired level of build, stock to mild (I'm guessing you'll still want to pass smog) If you want to get crazy with the build the budget gets just as crazy. Some things should NOT be skimped on, like gaskets, bearings and machine work. Find a reputable shop, one that is familiar with the 4AGE if you can. Your local car parts store engine isn't the way to go. Get yourself a service manual, at minimum Haynes or Chilton but the 'Yota book is best. Study the processes before you start and keep the book handy during, or else you can run into a snag and get things all jammed up or break something you don't want to break. Take pictures! When you have a question posting a pic can be a great help and having that reference can be a life saver on reassembly. Thanks a ton, As far as experience and tools go, I have a bunch of sockets, extensions, wrenches etc. as well as a couple beefy floor jacks and I have a friend with an engine hoist so I should be set for tools (and I just cleaned out my garage so i'll have the novel experience of working on a car inside). Where experience is concerned, me and my friend with the hoist did a relatively plug and play engine swap on his Nissan 300zx (Nissan engine of the same era and full ecu swap so everything just plugged in). This didn't have much engine teardown but my confidence in knowing what to do with regards to just working on cars in general. As to what I want out of this build, my budget is around 2500 with the goal of just a healthy 4age that I can have fun in the back roads with and maybe auto-x. I have already picked up a Haynes manual because I was having trouble tracking down a BGB. Thanks so much for the input, it will make this process a lot smoother. Now for some specific questions, for engine removal, the Haynes manual recommends putting it up on regular jackstands and removing the head beforehand so you can slide it out from underneath the car. In your experience, would this be a good way to go about it or are there better options? 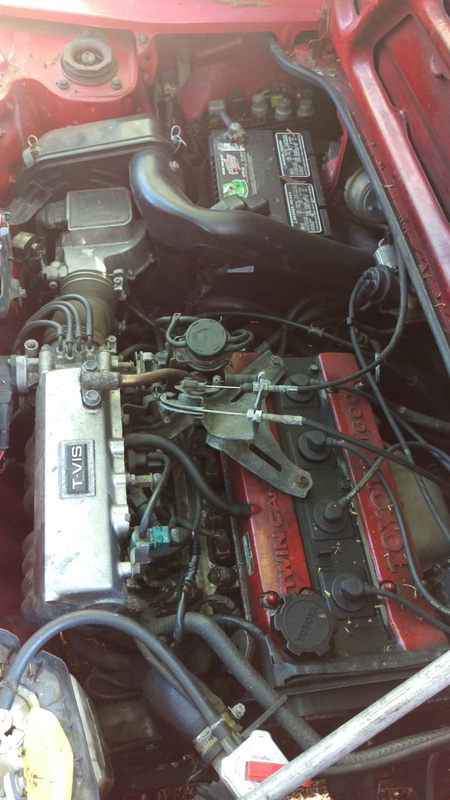 Also, I am just curios what specific 4age I have because it seems at some point in this car's life somebody gave the valve covers the ol' red spray can treatment so im not sure whether its actually a bluetop or a redtop. Here's a picture of the engine bay so if you can easily tell from that or if its in the vin id love to know. Anyways, Thanks for all the help and ill be sure to shoot some pics up here if anything is snagging me during this thing. You can check for worn rod bearings by removing a spark plug, turning the engine over by hand until the piston has gone just past TDC and on its way down the bore then carefully insert a long rod into the plug hole and push on the top of the piston. Any movement downward will be rod bearing clearance. Removing the head is for clearance, most jack won't have enough height to allow the whole assembly to slide under the rear of the car. Removing the head would also make it easier to get the engine down with less chance of scratching the engine bay. Would probably be a better way to go for the first time as well! Valve cover colors are basically useless as pretty much of the engines parts are interchangeable throughout the years. Even the number of the ribs on the block won't tell you what the internals are. The info from Totta up there is a good method to diagnose a rod bearing or wrist pin problem. As for the rest of all that, tools etc., sounds like you have a good start. Especially if you have an extra set of hands! If it's the original 1986 engine, it's probably an early bigport (40mm rods, not a fully counter-weighted crank) aka a "Bluetop" (never call a 16v by a color, it's just inaccurate and confusing). Removing the oil pan would reveal which crank you have. Even going by year to identify the engine isn't really accurate. I bought a RWD 4A-GE longblock from someone who pulled it from his 1987 GT-S, and it was a 7 rib non-squirter block but with the 40mm crank & rods. Its got TVIS, so its a bigport. Further disassembly needed for further id. Sounds like you got the skills to deal with this. I haven't worked with MR-2 aside from scanvenging some parts at junkyard so don't know MR2 specific hints. The engine you will want a good machine shop to deal with things you cant do at home, but you can do the tear down and take it to shop to have them measure it. Then decide what work needs to be done. Alright, Thanks @totta crolla for the information I'll do that test to see if its wrist pins or rod bearings. @sirdeuce I will probably do that then, thanks for the input. @Rogue-AE95, I'll refrain from that terminology in the future, thanks for the info. And then for any of you, if when I get the engine apart the block isn't a write off, how far will a budget of 2500 get me, is that enough to spruce up the engine a little bit or given the shape its in is it all gonna go towards getting healthy again? $2500 is a decent budget. Find out what damage is done and you'll have a better idea of where to start. You're going to get suggestions of what you have to have, some are just personal preferences of other people, some are necessities. Examples being a 7-rib block is a must and a 42mm crank/rod set is a must. You can get a decent set of cast pistons that will do well enough and save you hundreds over forged. PERSONALLY, I prefer the 7-rib block. I can go either way on the big or small crank/rods and the cast or forged pistons depending on what I'd like out of that particular engine. What is the engine YOU want? sirdeuce wrote: $2500 is a decent budget. Find out what damage is done and you'll have a better idea of where to start. You're going to get suggestions of what you have to have, some are just personal preferences of other people, some are necessities. Examples being a 7-rib block is a must and a 42mm crank/rod set is a must. You can get a decent set of cast pistons that will do well enough and save you hundreds over forged. PERSONALLY, I prefer the 7-rib block. I can go either way on the big or small crank/rods and the cast or forged pistons depending on what I'd like out of that particular engine. What is the engine YOU want? Yeah, I will have a better idea of what direction to go once I see the extent of the damage. As to the components you recommended/discussed, I get that forged pistons are potentially stronger; but what are the advantages of the 7-rib block and 42 mm crank/rod set? And would the crank and rods and pistons be something to just buy like a lower mile donor corolla engine for or, are there relatively inexpensive aftermarket or OM parts out there? As for what exactly I want, I'll have to see what the advantages of the various components are, in general I'm looking for something that will run smooth and reliably but won't mind singing on the back roads. My thought here is that I could put more money towards cams and tuning and whatnot but I'd like to save a bit to make the car decent cosmetically, the seats and paint are completely shot so that's like another grand to have those done decently, not show car or anything, just nice to look at. Anyways, I digress, thanks for all of the tips, I'm hoping to really get started after Christmas as im gonna be out of town for awhile and ill keep you guys posted on how its looking. 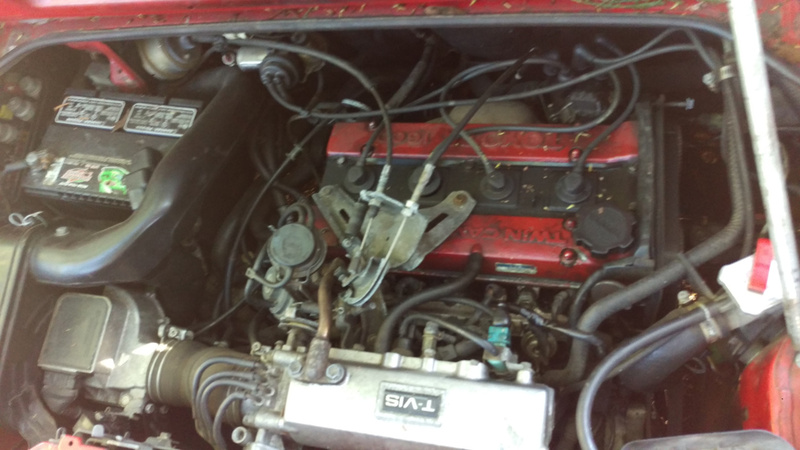 $2500 is a good/quality rebuild*, with a set of cams. * - rebuild: complete dismantle, clean (@ the machine shop) and check all parts for re-usability, machining time, replacing all wear, or worn items as needed. Typical wear items: engine bearings (main, and rod - typically about $100-$200 depending on brand used), piston rings (about $125), gaskets and seals($225+ for OEM - others available with varying rates of success). Timing belt and tensioner - $75+. Since your engine has a bad knock, I'd also plan on a new oil pump as well, for the oil your engine may have been ingesting may have bearing material and caused wear. Now would also be a good time to replace cooling hoses and checking other wear items too - water pump comes to mind. OEM 4AGE pistons are not as strong as aftermarket, BUT they have worked perfectly fine in many 4AGE engines for hundreds, of thousands of miles - you DON'T have to buy expensive pistons to get a decent build/power. Ok... now as far as a performance boost goes... the very first thing I'd recommend is planning on a compression rise. The original 9.4:1 compression ratio is just too weak to allow other mods to achieve their best results. Plan on a minimum of 10:1, if you are keeping the stock cams, and a minimum of 10.5 for a MILD(214 degree @ .050" lift) cam. As you look at different cams, the longer the duration, the more static compression you will need for them to operate correctly. Camshafts: You are going to see a lot and hear a lot.... Some basic camshaft info - the stock 16V engines had 2 camshaft offerings, 240(204 @ .050"), with 7.5mm lift, and a 232(198@ .050") with 7mm of lift. The more duration you add, the longer the valve is open (AND conversely the shorter it is closed) this lengthening of duration allows some of the compression to escape, so typically you add more compression for longer duration camshafts. Look around for dynamometer charts showing what people have built, and the power that was made. oldeskewltoy wrote: $2500 is a good/quality rebuild*, with a set of cams. Alright, thanks a ton for the info, any recommendations for finding a machine shop suited to work on my engine, I'm in the bay area so if anybody knows any specifics, thatd be great but just in general, what should I be looking for? On cams and compression. You live in an "enhanced" smog test area. The way they test these little cars actually takes them beyond normal operating parameters. Cams approaching the 260-270 advertised duration tend to make passing the test on the difficult side. Not saying it can't be done with the right tune, but it tends to be harder. You can pretty much forget about it with anything beyond that. Compression ratios should be on the conservative side to keep your NO down. 10.5-1 with a 250-ish duration is a decent combo to keep the emissions down. Even with that you'll need to pay more attention to the tune for the smog test. Take any suggestion on this subject with a grain of salt. Joe Blowhard will tell you he passes smog with 12-1 comp and a 288 degree cam running 87 octane, with no problems. BS! Do the research if you plan on any upgrades. Until you have the tuning experience keep it simple and as you learn the process you can go farther. Just a word of caution. A lot of the people that will give advice don't have to put up with our SMOG Nazis and don't understand the stupidity we have to put up with. You can drive in to a smog shop here and be turned away if the idle is a little off smooth or the car has been lowered. It can be a real pain. Just wondering, how much did you pick the car up for? I might sell mine because it has rod knock as well. Frany wrote: Just wondering, how much did you pick the car up for? I might sell mine because it has rod knock as well. Got this thing for 800, think i might have over paid a little. 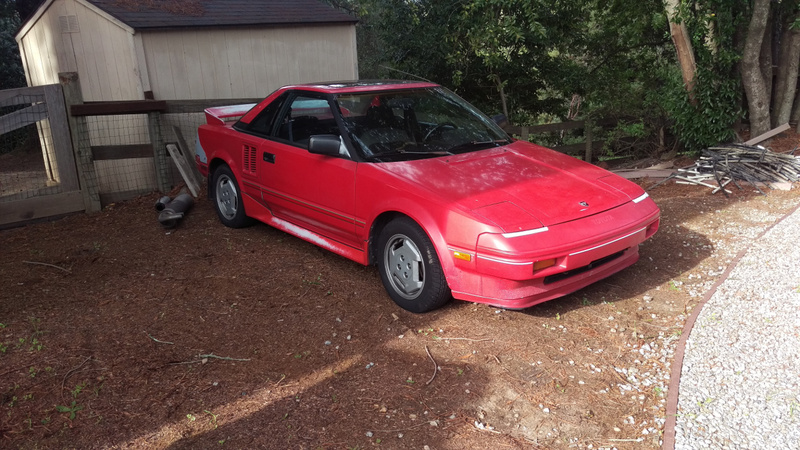 I'd give 800 for a non running MR2 as long as the body had no rust or major damage. Or RED, I hate red. It would be a great building platform. Most I've paid for an MR2 is 2500. Bad suspension, but good everything else. Gave me a place to put the suspension from my wrecked 2. Same here, I don't know what it is about the color red, but I just think it's too much on a car. It's too bad, there are always really cheap red MR2s/AE92/86's and even FX-16s out there. I hate red because they become chalky red. Red isn't the most stable color. Let's stop bashing red now. How's the MR2 coming along? getting an engine or rebuilding yours? First off I kind of have to agree with the whole red rant but it seems like 90% of AW11s are this same red lol. The car is reasonably rough in most areas. The engine is highly questionable, all the leather inside is gone, the paint has been baked down to the primer in a lot of spots and one of the quarter panels has a bunch of holes in it where some would be backyard autobody specialist pulled a dent with the self tapping screw method and stopped there, making the car look like it took a shotgun hit to the quarter panel. Good Things are rust free and a solid transmission. Ive been out of town seeing family for the Holidays and So far I've flushed the coolant (a lot of nasty brown gunk removed) and started on disconnecting and labeling lines and wires. I think that I'll be sticking with this engine unless its irreparable. What I am still kind of wondering about is how much of the process to pay a shop to do and how much to do on my own because I really do want this to be a hands on learning experience, I don't want to hurt the quality of build by stubbornly trying to do the entire thing myself. So of course for the valves and whatnot ill have to pay a shop to machine them but for things like checking clearances and tolerances, The Haynes Manual shows how to do all that stuff with plasti-gauge, feeler gauges and micrometers so, my question here is doing that sort of thing a feasible and pursuit or am I better off going to someone who does this sort of thing for a living? Thanks for all the input guys, you are all making this a bit less daunting. If you go the shop route get to a well respected 4AG builder. There are some that people will suggest. I can't give you any shops in your area, I'm not familiar. A good shop will cost a pretty penny, but you can be sure of the build. Do be careful of taking references from peeps that don't have 4 bangers, they tend to go with shops that would prefer NOT working on out little garbage engines, y'know the ones that are big iron builders. If you don't mind shipping there are awesome builders out there. I suggest taking a lot of time and doing it yourself. Take it apart slowly, taking in all the details of the engine. Ask a lot of questions. Read the build threads. You will have to have all the machine work done by a shop, but at least you'll have an idea of what is being done. Get it all home. Clean it, paint it and SLOWLY assemble it. You'll learn a LOT and you'll have an appreciation for what goes into the little mill. A better understanding of how it all works. Big plus is the bond you'll have with your 2. The more you do to/with your 2 the more enjoyment you'll have with it. sirdeuce wrote: If you go the shop route get to a well respected 4AG builder. There are some that people will suggest. I can't give you any shops in your area, I'm not familiar. A good shop will cost a pretty penny, but you can be sure of the build. Do be careful of taking references from peeps that don't have 4 bangers, they tend to go with shops that would prefer NOT working on out little garbage engines, y'know the ones that are big iron builders. If you don't mind shipping there are awesome builders out there. Yeah, that was what I was thinking of doing. Pretty excited, started working the process today and all I have to say so far is that the are a lot of damn vacuum lines, but I've been labeling them and taking pictures so i should be ok. Thanks a ton. I may have to take you up on that. Do you have to deal with emissions? If not, you can ditch a whole bunch of lines.